High Heels —— For spring-summer 2012 ready for an explosion of flowers and studs, details that El Vaquero presents its new collection of shoes, boots, wedges and decolletes shades of fashion this season hot with high heels or low, to look more glamorous. The historic fashion brand as our feet since the eighties, with its style solutions that never go unnoticed, and when it comes to talking to more casual shoes, and when we talk about shoes much more elegant. As in this case, where elegance and glamor coexist. After admiring the autumn-winter 2011/2012 El Vaquero, here we take a look trendy fashion brand has decided to propose to the warm season to come. A spring-summer 2012 in style rock and the floral, in line with the return of the sixties. Mood already emphasized by many other fashion brands, but also more essential elegance and glamor. 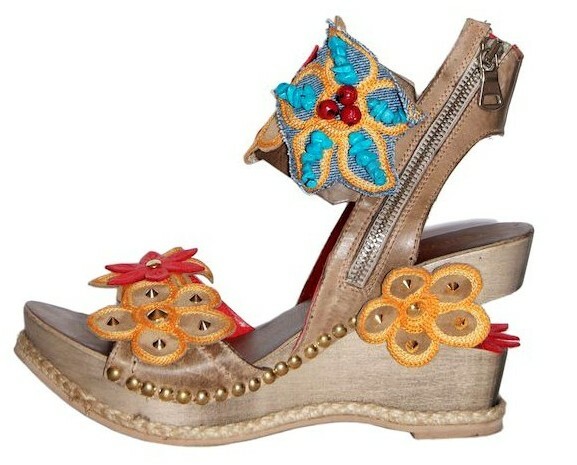 Floral style for El Vaquero style floral, so fashionable in these days of spring-summer 2012, we also suggested by the historical brand El Vaquero in a series of eye-catching footwear, glamor, perfect for a woman who wants to be hot this season with a Sixties style that does not go unnoticed. Shoes elegant and sophisticated, with a mood somewhat 'transgressive that never hurts in our wardrobe. Valerio Giuntoli, in line with this hot weather, place a capsule collection lit and colored prints are perfect for this spring, because with the arrival of the flowers bloom on March 21. Not only in the meadows, but also in our accessories: the shoes of El Vaquero are available with leather are truly innovative and valuable volumes never dull. The flowers bloom on cowboy, indianini, boots, wedges, but also, a vintage shoe model they fit very well with a return to bully the sixties and seventies, which must necessarily be present in our summer 2012. Details for Rock El Vaquero El Vaquero for not only boots, for the hot season offers us a model of decolletes very stylish and trendy, a preview for spring-summer is shaping up very interesting. Shoes from fiery red to a delicate sky blue colors the outside instead. A sky studded with gold and silver studs and Swarovski crystals that make this shoe model even more valuable. The shoes are proposed to us by Valerio Giuntoli with delicious details that make our wardrobe definitely interesting and glamorous. Heels perfect under a nice pair of jeans, but with a little dress elegant and chic. To look that will not go unnoticed!